Need Chanukah candles or a Menorah? You've come to the right place! Box of 44 multicolour candles, to last for the 8 days of Chanukah. The kit includes one gold colour tin Menorah, one box of 44 candles enough for the 8 days of Chanukah, 1 Dreidel and instructions. Beautiful decorative crystal dreidel with matching crystal stand. Enameled metal display dreidel with matching stand. Box of 44 big colourful candles, to last for the 8 days of Chanukah. Set of 44 ready-to-light olive oil cups with wicks to last 8 days of Chanukah. 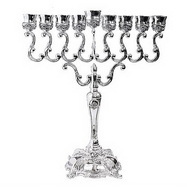 This beautiful 10 inch silver plated Menorah, can be with either candles or oil and wicks. Beautiful floral design decorates the high-shine nickel-plated menorah throughout, and uniquely curved candle holders add visual appeal. Beautiful Ceramic Chanukah Menorah - Hand painted. To purchase any of the above items, please contact us. We wish you a Happy Chanuakah!